The brand teams responsible for the 10 top-selling pharmaceuticals from 2017 are doing marvelous work. Competing against similarly talented teams, they’ve steered their products toward the top of the sales chart. Here’s the But. All of these top-performing brands are missing an opportunity to further engage their audiences. 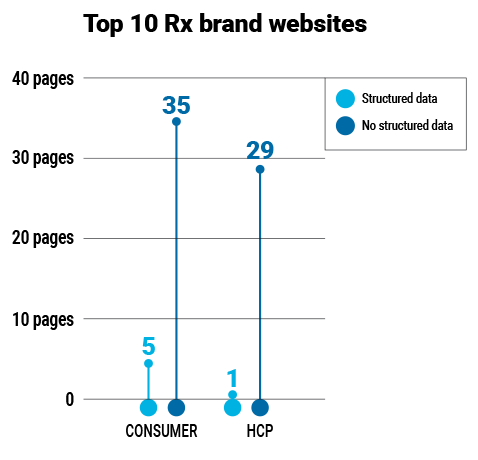 They largely or completely exclude structured data from their branded websites for consumers and healthcare professionals (HCPs). As a result, they overlook a tactic that can positively impact page rank, increase the likelihood of their content appearing in a featured snippet, and boost their content’s chances of being included in an audible answer from a smart speaker. Structured data refers to a standardized format for providing information to search engines, to clarify the context and meaning of Web page content. This format consists of properties and values organized into groups called schemas. At the end of this article, we provide a deeper explanation of structured data and schemas (Appendix 2). Why Should My Brand Implement Structured Data? Imagine that your content is the needle in the massive haystack that is the Internet. Structured data have been shown to positively influence page rank, which improves the likelihood that your content will be found. Structured data also enhance the prospects that your content will appear in a featured snippet, making your content more visible in the haystack and increasing the likelihood that it will be served as an answer to a voice search.4,5,6 Our own experience supports these findings. For 2 years, we’ve included structured data as a component of our organic SEO strategy for pharmaceutical, biotechnology, and CPG branded, unbranded, corporate, and clinical trials recruitment websites. Evidence indicates that structured data enhance website performance for our clients. In one case for an HCP branded website, combining structured data with other onsite optimizations and content led to a 202% growth in organic search (August 18 vs August 17). Two separate articles from Arteric’s blog provide an in-depth review of the impact of structured data on organic search and voice search. Structured data also enable search engines to display rich, high-value search results in user-friendly layouts and formats. As a result, search results display a large variety and quantity of visually emphatic information to inspire conversions. There is evidence that search results that include rich elements have higher click-through rates. “Next year, there will be two things we want to focus on. Google kept their word by expanding and enhancing their guidelines and training materials and expanding support for new schemas. In theory, these schemas create the opportunity for healthcare marketers to bolster search results with expanded information in emphatic formats. Brand teams could use the Dataset schema to display tables of efficacy data, use the HowTo schema to share dosing information, and use the FAQPage schema to transmit the information and impact of an FAQ page directly into a search result. 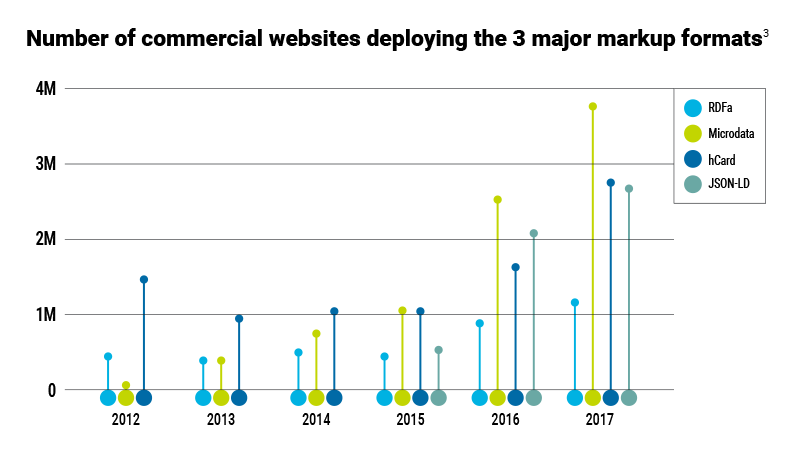 Google’s commitment to structured data as a method for enhancing search engine performance and the user experience began several years ago and is accelerating. By clarifying meaning and context for search engines and by providing rich information that informs smart click-throughs, structured data provide an everything-to-gain upside that we encourage brand teams to exploit. Our experience over 2 years is in line with the rapid integration of structured data across other industries. Healthcare marketers would be well served to follow suit and apply structured data. Adding rich markup and schema represents another round in the evolution of Arteric’s world-class SEO practice. As we’ve done for decades, we’ll continue to monitor search engine trends and perform the research that prepares our clients’ brands to succeed today and for where the search algorithms will be in the future. Contact me to schedule a 15-minute introductory call to discuss how to build brand wins with structured data. Call me at 201.546.9902 or EMAIL ME. If you would like Arteric to respond to your RFP or RFI, please email to rfp@arteric.com. 20 best selling drugs 2018. IgeaHub website. https://www.igeahub.com/2018/04/07/20-best-selling-drugs-2018/. Published April 7, 2018. Accessed August 30, 2018. Burton W. Just how important is structured data in SEO? Search Engine Journal website. https://www.searchenginejournal.com/how-important-is-structured-data/257775/. Published June 21, 2018. Accessed August 30, 2018. Web data commons — RDFa, microdata, and microformat data set. Web Data Commons website. http://webdatacommons.org/structureddata/#results-2017-1. Accessed August 30, 2018. Over a third of Google search results incorporate rich snippets supported by Schema. SearchMetrics Web site. https://www.searchmetrics.com/news-and-events/schema-org-in-google-search-results/. Accessed August 30, 2018. Study: 80% of Google Home results come from snippets. But they aren’t always the source of answers for Google Home. Search Engine Land website. https://searchengineland.com/study-80-google-home-results-come-snippets-289992. January 18, 2016. Accessed August 30, 2018. Soulo T. Ahref’s study of 2 million featured snippets: 10 important takeaways. Ahrefsblog. https://ahrefs.com/blog/featured-snippets-study/. Published May 29, 2017. Accessed August 30, 2018. Technical SEO: the best opportunity for you to add value to your website projects. Forbes website. https://www.forbes.com/sites/forbesagencycouncil/2017/11/30/technical-seo-the-best-opportunity-for-you-to-add-value-to-your-website-projects/#8c920252dac3.November 30, 2017. Accessed August 30, 2018.